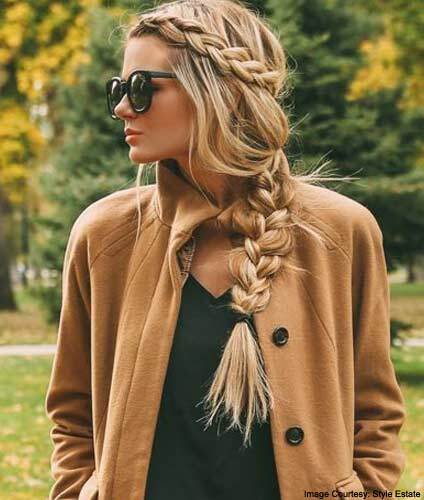 The braid has been a regular on sight on the runways for several seasons past. This season, be ready to give your milkmaid styled tresses an upgrade loaded with attitude. You will love this new hair trend that crosses the traditionally dainty nature of braids and the reputedly dark and bad image of punk in one hairstyle. Radically part your hair sideways, creating a straight part from your forehead, and all the way down your neck. Tie your hair on the thicker side with a pony so you don’t end up messing your braid. Next, tackle the side with less hair. Start by picking up a thin group of strands. Divide these vertically into three. Start crossing as in a simple, flat braid, for about two sets. On your third set, notice that one of your hands is holding two sections while the other holds one. On your hand that holds only one, pick up a thin group of strands where it ends before crossing it over as usual. Keep doing the same trick, left and right, as you move along towards the back of your head. Doing so will keep your braid tightly against your scalp. Once you reach the back, change your braid orientation to point downward. Start by conditioning your hair and giving it a quick spritz of heat protecting product. Work on your hair in sections, starting from one side to the other or, from nape to your hairline. Run your straightening iron slowly on your hair sections. Drastically part your hair over to one side, all the way to your nape. Take a very tiny section of the thinner side and part it into three. Do a quick french braid, similar to the trick described in Item 1 above. When you reach the top of your crown, tie the braided section in place with an elastic band. Do the same 3 or 4 more times. so that you end up with rows of braided hair on one side of your head. Cover the bands with your loose hair. Done! This technique practically gives your tresses a punked up look while keeping you feeling fresh and cool. Start braiding by taking a section of hair from the top of your forehead. Instead of the over and cross of your basic braid, this time, cross under. After the second or third set, start picking up remaining hair as you trail your braid down. Once you reach the end of your hair, tie the ends up. Next, loosen up your braids, strategically pulling to give the hair on your forehead a hump. A little hairstyling can go a long way. While a braid may be a classic, faux styling gives it the attitude it’s been missing. Give your tresses a makeover with these three faux braid styling techniques.